Please let me know if you want to change or translate. *Added 3 New lore books in different locations along the Dark Brotherhood Quest! *Added more information about Grelod the Kind at Honor Hall Orphanage. For those of you who are still squeamish about killing her, I suggest you download Innocence Lost Alternative which is fully compatible with this mod and offers a way out of killing her personally. If however you seek greater justification to kill her, I suggest you 1) speak to the children about her and 2) Read a few interesting things in her room. * Added another "clue" to get you through the initiation quest. May not make you feel completely guiltless for killing one or all of them, but at least you have an idea. *Fleshed out contract backgrounds. You now have a background of some kind on every person you're killing. Cleaned up typos and added quest description content that reflects the background of the person you're killing. * Added more clues (see clue list in articles section for spoilers!) and a final treasure hunt at the end! *All dossier's now provide a training point level. Version 3 is now available!! * BUG FIXES - All dossiers now work fine! USLEEP COMPATIBLE! * MORE CLUES - Get more immersion as you find clues for the main Dark Brotherhood Questline! * THE BOOK OF DEATH - Learn more about the contracts of the Dark Brotherhood. You're not the only assassin you know! * BETTER DIALOGUE - Sound less psychopathic, but still have personality! Version 4 is being tested and will include a new quest, as well as the Wrath of Sithis - a curse that will be bestowed if you displease the Dark Father! Will be uploaded soon. V 3 already has the scripts so updating will be easy! A huge thanks to Happtreedance for her fantastic review of this mod! THE THIRD UPDATE WILL COME AS SOON AS I CAN GET IT TO YOU! Scripting for "let them go" option is coming along but still slow work. This mod provides dossier's and hidden clues that allow you to understand the reasons behind a contract and allow you to be a "non-sociopath" and even semi-moral character while still going through the Dark Brotherhood quest. This is the SECOND release, and it has been tested thoroughly, has been used with over 250 mods installed with it so I know it's compatible with a lot, and has minimal scripting if any. I plan to make updates to it regularly and take suggestions and requests to make it better as I go along. Did you ever wondered who wanted poor Narfi dead? Now you'll find out the who and why! Even if you don't want to be a good guy, you can use this mod to get more out of the quest line and understand the reasons behind everything, including the Emperor's murder. Uncover a complicated conspiracy with clues hidden all over Skyrim as you go through the main Dark Brotherhood quest line! I've done my best to make this as much of a reverse-murder mystery as possible. Feel bad for crashing a wedding? If you find all the clues, you won't. 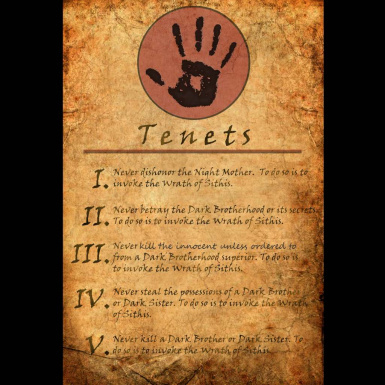 In short, this mod will not only restore a readable version of the tenets, including the original Third Tenet (which some might consider a "good version" of the tenets), but also adds extra lore books to the game about the Night Mother and the reasons behind the change to the Tenets, as well as dossier's on every contract, and hidden clues all over Skyrim in regards to the main Dark Brotherhood quest line. These clues are usually in the forms of notes, letters and journals; some will be laying around and others you will need to pick off of prominent people you encounter, such as perhaps a wedding guest you meet on the road, or even a Steward or a Thalmor official. You never know where they'll turn up, but every clue will give you hints as to the conspiracy that's happening and prepare you for the main contract. In as lore friendly way as possible, I have tried to give you the backstory on every contract that you will at least know what moral grounds you have if any to kill someone. I will say however that I did not remove the moral choices from the game; some killing you may do for the "greater good" if you understand all the clues, and others you may still feel a little guilty for killing because you don't like my explanation. Either way, you will at least have some context. In the end though, you're a Dark Brotherhood assassin; you kill because you were ordered to. They may not be totally evil after this revision, but they aren't priests of Mara either. As I said before, this mod has been tested with over 250 other mods installed, including Skyre, Helgen Reborn, and even Dawnstar Sanctuary customization mods. So long as you do not have a mod that alters the inventories of the main DB members or other quest related characters or mods that alter the main sanctuary or storyline, you should be fine. This is my first release so if you DO find a mod that conflicts, please let me know and I will try to make a patch or figure something else out. There is minimal scripting in this mod so crashes should not happen. Literally, the only script is them handing you the dossier! For Nexus Mod Manager, click download and then install with the mod manager like usual. If doing so manually, put the .esp in your data folder and the texture files in your texture folder. Is this mod lore-friendly? : Yes....and no. Lore is based on the books and past facts established through out the Elder Scrolls series. I have read every wiki entry and gone over all the books related to the lore, and some of it is subjective at best, interpretable and open to being flexible. In short, I have added clarification and additional books to the game to not necessarily alter, but certain "re-interpret" the established lore. If that means it is not lore-friendly then fine, but I designed it so it would feel like part of the established lore already. Is this mod overly fuzzy and good-guyish? : No. If you join the Dark Brotherhood, you are an assassin, period. You kill people for money and that won't change. But are you killing in part for money but also to make the world a better place by killing scum? Possibly. It depends on how fluid your morals are. At best you are a chaotic-good character, but not lawful good. If you are lawful good, you need to kill Astrid and Destroy the Dark Brotherhood. This mod is more for people who can justify a death in their mind if it serves some kind of noble purpose, but even then, it's all open to interpretation. I did not take away anything from the first two quests to get you into the Dark Brotherhood. You still have to kill Grelod and you still have to kill one of the three captives. I figured if you asked them questions, it would give you more than enough moral justification. Also, the first contract Astrid gives you has no dossier because you are acting as a "Speaker" and talking to the client directly. She gives you plenty of justification and you thus have no need for a dossier. Her extra quest though is entirely up to you, the character. Can you tell me where all the clues are? : Please see the articles section for a complete list. WARNING: Contains Spoilers!